I was getting something similair to mine but it was because I had the voltage too low, like green dots on webpages etc have you been messing around in WAttman? Yes I have! But ever since I had it back to balanced. Unless it didn't get applied. Does your GPU display an image at POST? Which drivers are you using? With my V56 if I use any drivers later that 18.12.1.1 I get a black screen after the Windows logo when I PC boots up. I assume thats when the drivers load. I find wattman has an issue with keeping my saved settings, maybe yours are messed up? Tried a full driver uninstall, clean install etc? It could be your EVGA 550GS supernova PSU is not good enough to run a Vega 56. You should use two separate GPU cables as well to run a Vega not one. Do you run afterburner as well? I had the exact same issue and it was the "Erase autosaved startup settings" under the general tab of afterburner that was causing it. Cheers mate, but don't user afterburner. The only other piece of software I had been using was clockblocker but have since disabled that, problem still persists so may do a big reinstall myself. Cool, the other thing I have installed is OverDriveNTool which seems to help with getting wattman to keep its settings. So I tried another game with my pulse. Tomb Raider. I see this white flicker of some textures (in tomb raider it was actually smoke that was turning white for a split second every so often), even on the balanced clock. I noticed it happens more regularly when fans spin up. My coil whine also got quite bad. Is this another GPU I need to RMA? GPU-Z reports 182W of draw on the balanced profile. Thought I could hold out until later in the year but have cracked and gone for the pulse. I'll have to take a closer look at the rest of this thread but is there a general consensus on the undervolt settings or is it card dependent? It depends on the card. The settings I use are fairly tame as I wanted stability with reasonable lower temps. With tweaking better performance is available. In most games unless hitting an fps cap the Gpu is heavily utilised. Great thanks for that, I'll hopefully get around to installing it over the weekend so will give these a try. my card is dead, turned on my pc this morning to massive icons on the screen. 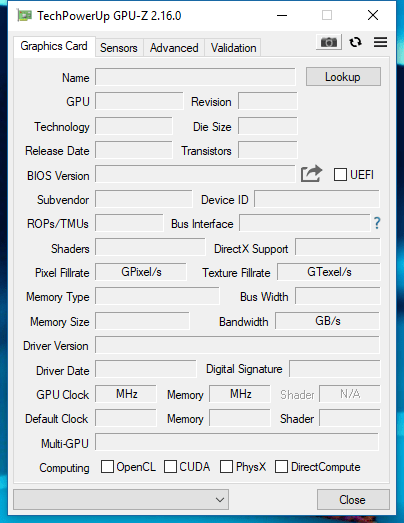 showing no card in device manager,gpu-z, furmark or heaven. Was working fine last night as I played Farcry 5 for a few hours. any ideas guys as it's a pretty new card and I am gutted if it's dead.I have checked and re seated the card and the power, all good. Card is lit up but nothing else. PSU is an XFX 750w so plenty of power and 2 leads to the card. Not changed anything since last night mate. Well this is doing my head in, re installed the first vega 56 driver and it's back up and running again. 2) Use a Good PSU 650w, its dependant on your system but I wouldn't go below this. Hey guys, I haven't read the whole thread so sorry if this has already been addressed but I've just had a Sapphire 56 Pulse and i thought I'd report my findings.. I use Pcars2 to do the tests, watching replays with different settings etc. Overclocked it eats 1440p@75hz (Frame limiter set to 74fps) including replays and even can do QUHD@60 whilst racing (Cockpit view) but is console like in it's 30fps odd replays. One thing i noticed though is the HBM temps.. If i leave it at 950Mv, overclocked, GPUZ reads 99deg! but if i lower it to 900Mv it stays below 70deg but will still perform a stable 950mhz. So i suppose these stock voltage settings are wrong or something, which is odd but all in all I'm well chuffed with my upgrade. If anyone asks can Vega64 do 4K@60hz, based on my performance results for V56, I'd say yes, just about. Going by what I've vaguely read elsewhere, the Vega series needs a bit of care and attention (undervolting, possibly even a BIOS flash) to achieve its highest performance in frame rates / thermal performance. I'd suggest you look into it.